I’ve mentioned my fabulous babysitter Erika here before. I feel more and more that she is a member of our family. One of the wonderful things about her (and there are many wonderful things) is that she has introduced us to some of her friends. When she is unable to sit for us, she will work hard to find someone who can. I am one of the luckiest moms I know because we have a small stable of wonderful young women who watch our boys from time to time. One of these lovely young women is getting married this summer. After having some problems with caterers, she approached me and asked if I would be interested in taking the job. It’s a wedding for 50, the location is a ferry ride away, and they want to do an Asian theme. All significant challenges for me. So of course I said yes! Kirsten and her fiancé are incredibly sweet and accommodating and, most importantly, flexible. She is about as opposite from a bridezilla as you can imagine. Because they have never eaten my food (just looked at this here blog), I invited them over for dinner last night. We had a lot to discuss and I wanted to make sure they liked my ideas and my food. I decided to make Vietnamese Yellow Curry because I seemed to remember the last time I made it that it was delicious. I thought it might be something I would make for the wedding, mostly because I know much of it can be made in advance. Truth be told, it’s pretty tasty, but not worth the amount of work involved. There are four distinct steps in making this dish and a ton of chopping. If I counted up the number of pots I dirtied in making this humble curry, you would be appalled. 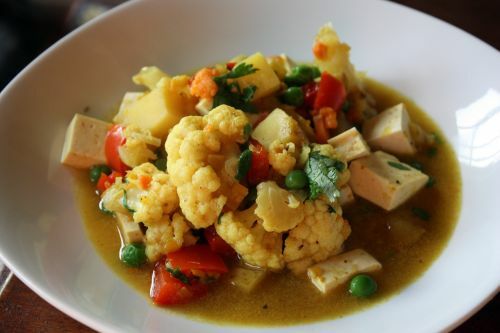 I don’t know all my readers well, but I would guess that no one would actually make this labor intensive curry if I spent the time to post the recipe – especially I told you it wasn’t worth the effort. So instead I give you cake. I expect you must be tired of my yammering on about Holly B and her amazing bakery on Lopez Island. But this cake is exactly why I love her, her bakery, and her book. When I walk into a bakery, I don’t want a treat that defies the laws of gravity. I want something homemade, homey, and delicious. Not exquisite, just exquisitely delicious. As I pulled this cake out of the oven, I imagined it in my perfect restaurant/bakery – the one I will open someday (the one with good sandwiches). Nothing earth shattering here, just a simple cake on the bottom, a fruit compote in the middle, and a crumble topping. But somehow it all tasted perfect. In the introduction to this recipe, Holly mentions that you can make this same cake with any fresh or thawed (and drained) frozen fruit. If you do use another combination (favorites include Raspberry-Peach, Blackberry-Nectarine, and Cherry-Apple), there is no need to cook the fruit. Just lay it over the cake batter. Make the filling: Combine the rhubarb and strawberries in a saucepan and cook for 5 minutes over medium heat. Sprinkle with the lemon juice. Stir together the sugar, cornstarch, and nutmeg. Distribute over the fruit, stir and reduce the heat to medium-low. Cook, stirring often to prevent sticking, until the rhubarb is tender and the liquid has thickened. Set aside. The filling can be used immediately or stored in the refrigerator for up to 2 weeks. Make the streusel topping: Place the flour, brown sugar, cinnamon, salt, and butter in a food processor fitted with the steel knife blade. Pulse to cut in the butter and make a nice sandy-textured topping. Don’t over-process. Stir in the oats by hand and set aside. Reassemble the food processor without washing. Preheat the oven to 375°F with the rack in the center position. Butter an 8-inch square baking dish. Make the cake layer: Place the flour, sugar, baking soda, baking powder, salt, and butter in the food processor bowl. Pulse until the butter is reduced to BB-sized bits and the mixture is dry and crumbly. Scrape into a bowl Whisk the buttermilk, egg, and vanilla in a small bowl and add to the dry mix. Stir just until a dough forms. Assemble the cake: Spread the batter evenly in the pan and cover with the strawberry rhubarb filling. Distribute the streusel topping over the fruit. Bake the coffee cake for 50-60 minutes, or until no gooey batter shows when you probe into the cake. Cool the cake for at least an hour before serving. 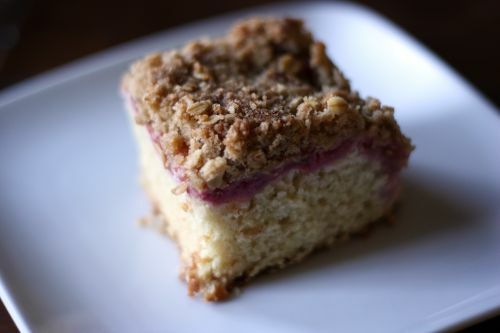 I am in a coffee cake state of mind lately, could eat it every day, and this looks fantastic! I like that there are oats in the topping, and the blackberry nectarine combo sounds great too. That cake looks so good! I must admit that I want some of that curry too. I thought that they were usually a one-pan kind of dish, no? That’s disappointing about the curry dish. Looks delicious though, as does the cake. This bride and groom know how to choose a caterer! I am a sucker for a streusel-topped coffee cake. 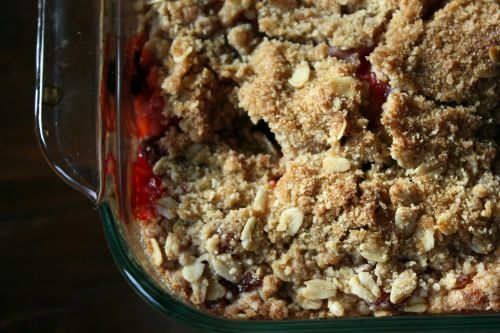 I am going to add this to my growing-by-the-hour list of rhubarb recipes to try before the season is over. I’ve got rhubarb and strawberries and this just looks too good to pass up. Rumour has it that the weather might cool down next week which would be a perfect time to try this out. Dana, I’m not getting tired of hearing about Holly! All her recipes sound delicious. I’ll have to put her book on my amazon wishlist. I’m quite interested in your gazpacho mention at the end of your post. I’ve got to make it next week for my barefoot bloggers group, and can you believe I’ve never had it before?? I’m looking forward to trying it because it sounds so healthy and refreshing. I have to make Ina Garten’s recipe next week, but since yours is different from hers, I’m adding yours to an upcoming menu as well. Have a good weekend! This cake looks so delicious. It’s the perfect time of year. I’m ready for it!